Sarasota County Commissioner Nancy Detert cast the lone vote on the board on Jan. 25, seeking to deny Benderson Development the opportunity to continue a process it has initiated with the hope it can build a mixed-use development with density up to 25 units per acre on the northwest corner of the Stickney Point Road/U.S. 41 intersection, just east of Siesta Key. “These are the things that we all worry about: height, [hurricane] evacuation route,” she told the approximately 50 people in the audience and her colleagues. “I’m worried about the stress to other roads, the density” and the lack of affordable housing details, though staff had assured her that affordable housing would be required of the project. 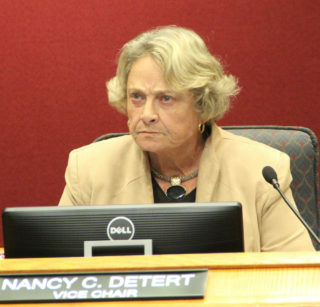 Detert also voiced frustration with the fact that if the commissioners felt the information provided through the studies was inadequate, they could ask for more analyses, prolonging the process — “Death by a thousand cuts,” she said, referring to the old adage. 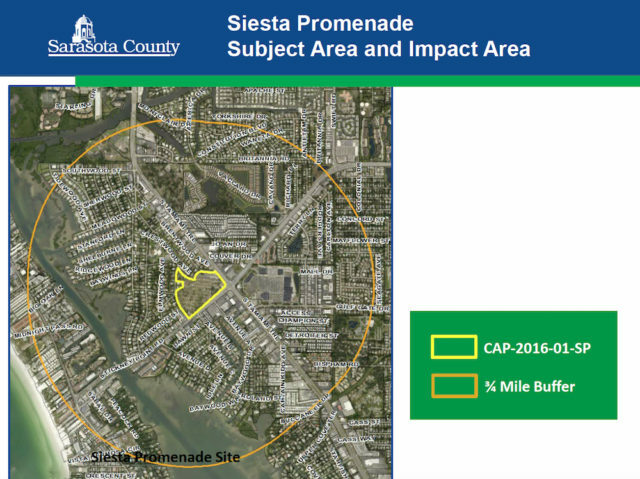 When it came time to vote, Detert first made a motion to deny approval of the scope of work for the proposed Siesta Promenade project to be constructed under the aegis of a Critical Area Plan (CAP), but that died for lack of a second. Commissioner Mike Moran then sought clarification from Deputy County Attorney Alan Roddy that all the board was being asked to do that day was to allow Benderson to proceed with undertaking a gamut of analyses — including many focused on traffic — as part of the CAP application it had submitted to the county in August 2016. “This is not a public hearing,” Moran noted. 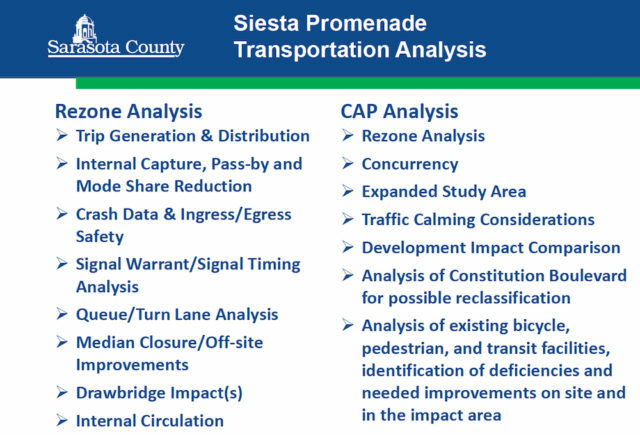 His understanding, he continued, is that “we’re not even close to the end of public input.” If the board approved the scope of work, Moran said, it appeared “there will be plenty of time for debate, input, healthy discussion” before Siesta Promenade could win final county authorization. “That’s a fair summary,” Roddy told him. Moran then made the motion to approve the scope of work. Commissioner Charles Hines seconded it. Chair Paul Caragiulo concurred that the CAP process — and the more intensive analyses of the potential impacts of the project on the surrounding area — would provide detailed information for the board to assess in deciding whether to grant ultimate approval of Benderson’s plans. Referring to Mathes, Caragiulo pointed out, “He understands the situation,” including the potential for the commissioners to request an expansion of the proposed CAP boundary — as speakers urged them to do during public comments before they began discussing the scope of work. Commissioner Alan Maio noted the hundreds of emails he has received, mostly in opposition to the plans for Siesta Promenade. If the board did not allow the CAP process to proceed, he added, “Our ability to make these kinds of demands [for intensive analyses] goes away.” Still, he said, “I’m not a fan of the ‘maximums,’” referring to density. Arguably, one of the more intensive aspects of the scope of work will be the traffic analyses — during season, as specified by the board — and not just of the immediate area around the approximately 24-acre site but in regard to other nearby neighborhoods and retail areas. Mathes of the Benderson firm told The Sarasota News Leader after the discussion, “We’re going to start right away” on the entire scope of work. “I can’t imagine that we’ll be doing anything in less than a month.” However, he added, he was hoping that the firm’s consultant — Kimley-Horn and Associates of Sarasota — could handle the traffic analyses in March. “We know we have a big homework assignment,” Mathes told the News Leader. County Planner Todd Dary and Paula Wiggins, the county’s transportation planning manager, took turns at the podium to explain facets of the CAP process and the scope of work. Dary pointed out that on Oct. 11, 2016, the County Commission voted to delay a decision on the boundary of the CAP for Siesta Promenade, choosing, instead, to have staff come back for further discussion of the scope of work. The board members agreed during that October hearing that they would combine their decision on the boundary — the entire area to be encompassed by the CAP — the rezoning of the site and the CAP application itself all in one public hearing. 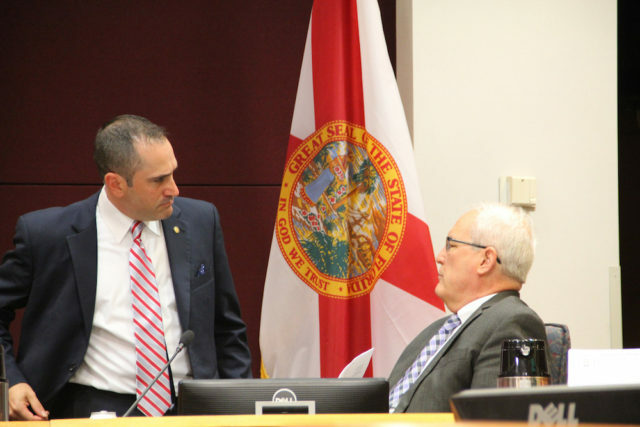 If the scope of work were approved that day, Dary explained, then the second phase of the process would entail the analyses staff — with public suggestions — had agreed would be necessary for Benderson to go forward with Siesta Promenade. The third phase, Dary said, would include the public hearings before the Planning Commission and the County Commission. Dary explained that the application Benderson submitted to the county Planning and Development Services Department staff in August 2016 called for up to 140,000 square feet of retail space, a 150-room hotel and 560 multi-family dwelling units in Siesta Promenade. The CAP designation would allow density up to 25 units per acre, instead of the standard 13 units per acre allowed under Commercial General zoning, Dary noted. Dary showed the board a series of slides that listed all the various requirements of Benderson under the scope of work — from illustrations of building height and buffers between surrounding properties, to plans showing how traffic would circulate within Siesta Promenade, to provisions for public open space and parks and recreation. 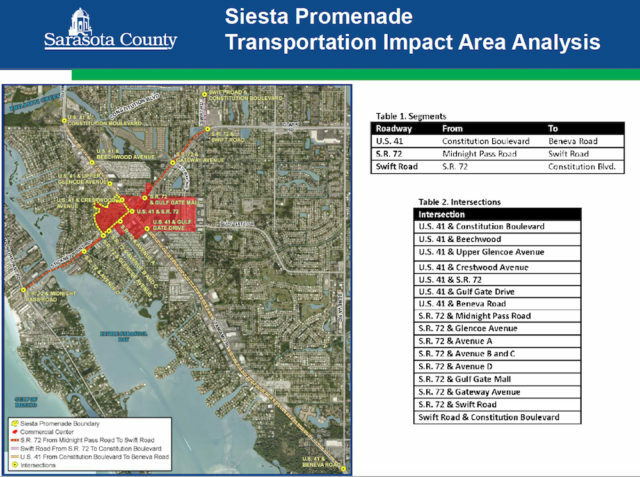 However — as demonstrated by the public comments at the opening of the commission’s afternoon session on Jan. 25 — the potential impact of Siesta Promenade on traffic is the primary concern, Dary noted. Therefore, he explained, Benderson will be required to hire a firm to undertake detailed studies involving three nearby road segments and 16 intersections. The road segments are U.S. 41 from Constitution Boulevard to Beneva Road; Stickney Point Road from Midnight Pass Road to Swift Road; and Swift Road from Stickney Point Road to Constitution Boulevard. Those analyses also will have to take into account the openings of the Stickney Point Road drawbridge, he said, and timing of signals on Stickney Point Road and U.S. 41 in the vicinity of the project. 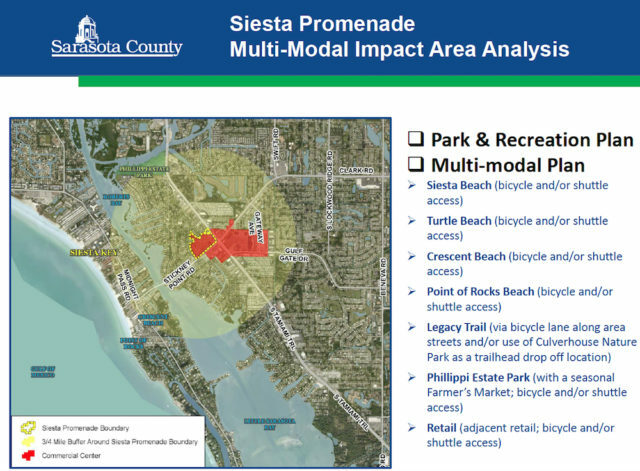 Dary also pointed out that separate studies will have to consider the additional traffic expected on the basis of “the highest and best” use of the Siesta Promenade property if it simply were rezoned Commercial General, as well as on the basis of Benderson’s winning the CAP designation for the site. 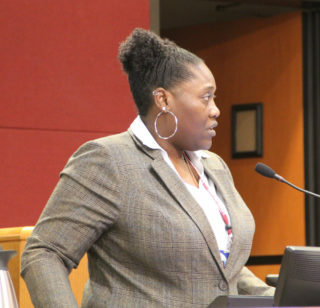 Commissioner Hines sought clarification about whether county staff would undertake the studies or whether Benderson would be expected to hire a firm to do them. “You get where I’m going with this,” he told Dary, adding that he also wanted to know what month they would be conducted. “Duly noted,” Wiggins, the transportation planning manager, responded. Staff would expect the analyses to be undertaken no later than March, she said, which is traditionally the final month of high tourist season. Further, she explained, Benderson would hire a consultant to handle the work. Nonetheless, she continued, the studies would have to comply with county and Florida Department of Transportation (FDOT) methodology; both county and state staff will review the findings. Then, in response to a question raised during the public comments, Wiggins conceded that the data provided by the consultant might be difficult for a layman to comprehend. “There’s a lot of math that goes into it.” However, she said, the summary of the findings should be written in such a manner that any person could understand it. Having spent over 50 years as a lawyer for or advisor to municipal governments, and over a decade serving on a City Planning Commission, these incremental “preliminary” approvals are as Commissioner Detert asserts “death by a thousand cuts”, and demonstrate a lack of responsible oversight by the rest of the Commissioners that pleads for their removal at the next election.